Whether you’re just starting the hop, or have come from a previous Pal’s blog, you’ll find the lineup toward the end of my post to help you move along. Please take a minute to mark your calendar for our next hop on September 13, 2017, for “My Favorite Season”. Now hop along using the Blog Hop Line-up below. Thank you so much for hopping with the Stampin’ Pretty Pals today. Don’t forget to leave us a comment. We’d love to hear what you have to say about our creative “Cuts”. Sending thanks to someone that takes the time to think of you in some way is important. I know we are all busy, but that gesture is so important to the receiver. I have had four baby showers this spring and one thank you. It was disappointing, to say the least. I am thankful my children have learned their lesson well. Here is a perfect card to say “Thanks A Bunch.” It really a simple card with the new Bouquet Bunch Framelits. I chose one of my favorite colors. Yes, there is another color I love as well as pink. 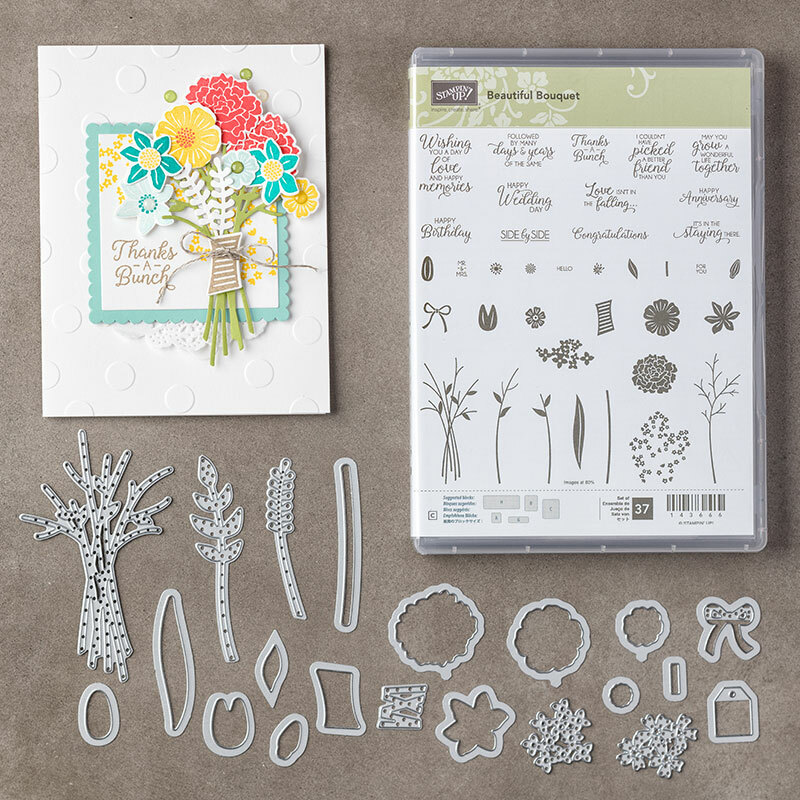 I have to tell you this stamp set Beautiful Bouquet has such beautiful phrases to put on your card. Just perfect for a Wedding, Anniversary or as I have chosen a Thank You card. I love when everything is in one stamp. Pamela, anyone would be truly grateful to receive such a pretty thank you card! The font on this sentiment is perfect! I love your choice of colors, thanks for sharing ? So cheerful! Who wouldn’t like to get this bouquet in the mail? I agree that saying thank you is so very important…this card is a perfect way to do that! Don’t you just love this bundle? Beautiful card — love the cheery yellow! So bright and cheery, Pamela! Thanks for sharing! Your yellow bouquet is beautiful, Pamela! Anyone would love to be surprised opening a bouquet!! Nicely done. What a wonderfully sweet bouquet and card, Pamela! Beautiful Bouquet! The perfect way to convey many thanks! This is such a happy bouquet of flowers! Love seaing what you made today ?